Thirty years after the second Death Star’s destruction, Luke Skywalker, the last Jedi, has vanished. An unlikely group get drawn into search for the Jedi before the First Order, a successor to the fallen Galactic Empire find him first. J.J. Abrams flourishingly takes over the reins from George Lucas for Disney. The production values, effects and music are outstanding with writers Lawrence Kasdan, Abrams and Michael Arndt successfully handing over the baton to the new characters without leaving the beloved ones behind. John Boyega’s Finn has depth and is very likable, as too is Daisy Ridley who is simply outstanding and steals the show as Rey. Oscar Isaac’s X Wing pilot Poe Dameron is memorable and somehow manages to encapsulate the look, swagger and feel of the original Star Wars spirit. If I were to nit-pick the Andy Serkis’ Supreme Leader Snoke hologram and the monsters hiding and attacking the Millennium Falcon as it hums back to life CGI is not without its problems. That said, it’s doesn’t distract from the overall great quality of the effects throughout, from the impressive practical and visual effects right down to jolting storms troopers, desert creatures, spaceship base interiors, sweeping planet topography and beyond. With droids housing information, space battles and giant weapons with weaknesses, yes, it’s partly a rehash of the first film with a few welcomed twists and surprises but it’s a really visual and emotional treat, with great sets, costumes, make-up and locations. The action set ups, shoot outs, spaceship dogfights and sabre duels are fantastically staged. There’s plenty of Han Solo gunplay and humour on display. The mix of new and old characters returning works and there’s array of familiar faces and quality actors including Max von Sydow and a hidden Gwendoline Christie as Captain Phasma. Well loved characters, not just the likes of R2-D2, Han, Leia, Chewie and C-3PO but lesser known ones like Admiral Ackbar and Nien Nunb also return. As the rebels face another threat, bigger than the Deathstar it manages to remain engrossing and grittier than its predecessors. There’s the emotional loss of a main character and Mark Hamill’s Luke screen time is fittingly limited which allows Ridley to shine throughout as she develops her skills along with droid BB-8. Adam Driver’s misguided Vader obsessed Kylo Ren is interesting. 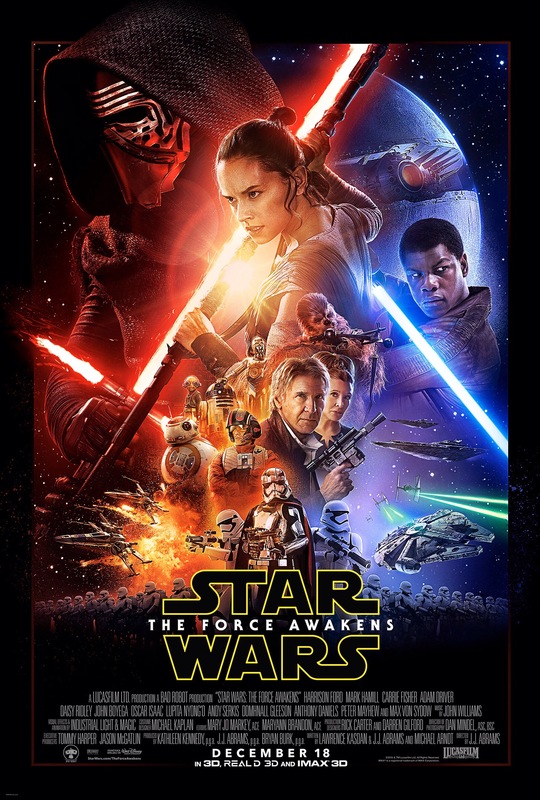 Overall, the young cast carry the beats you wanted and expected from a sequel to the original trilogy but it also excels as Abrams manages to fashion an atmosphere of his own while retaining the Star Wars feel and magic. The force is strong with this one. Highly recommended.